Luke Wallace, provided photo by Alex Harris. 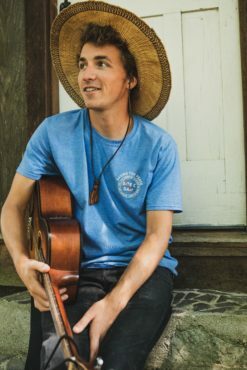 Folk musician and Salish Sea resident Luke Wallace will be stopping in Victoria on October 4 as part of his Fish First music and film tour. In June 2018, Wallace travelled with his music equipment, film crew, and other artists-at-large to Bristol Bay, Alaska, to shoot footage that will be shared through his Fish First tour. Throughout the trip, Wallace and his team sought to catalyze a coming together over the fate of the most productive salmon fishery on earth in the face of a proposed mining project called Pebble Mine. If constructed, the mining project will be situated in the headwaters of the two largest rivers feeding into Bristol Bay. Wallace has been an inspiring force across the Pacific Northwest and beyond with his music, and the efforts of his activism have been felt even here at UVic. “Over my time educating in the Salish Sea, I’ve encountered Luke in so many different locations — around campfires, during activist paddles, in community halls, and in living rooms in the city,” says Ryan Hilperts, professor and undergraduate advisor in the UVic School of Environmental Studies. Wallace’s recent venture to Alaska focused on inspiring people to rise up together for all that Bristol Bay holds dear, such as its salmon runs and its long-standing relationship with Alaska Native cultures. Wallace’s recent venture to Alaska focused on inspiring people to rise up together for all that Bristol Bay holds dear, such as its salmon runs — the backbone of the region’s ecology — and its long-standing relationship with Alaska Native cultures. However, the promise of wealth contained in the large mineral resources is what has attracted Vancouver-based Northern Dynasty Minerals Ltd. — a Pebble Mine project proponent — to the area. The mining company’s proposal has been met with resistance by the locals of Bristol Bay. Of those who commented during the EPA’s Watershed Assessment, 1 204 residents (98%), told the EPA they wanted Bristol Bay to be protected from the mining project. But Northern Dynasty claims the local economy will be boosted by the project. Wallace thinks otherwise. “We’re looking at a long-term, sustainable, and growing economic driver — that is, salmon — and a very short-term, destructive economic driver — that is, gold,” he says. Indeed, the salmon fishery at Bristol Bay has long served to boost the economy in the region. Mobilizing people around saving salmon is one of Wallace’s personal mandates — he sees such mainstays of subsistence and culture as important sources for solidarity. Wallace doesn’t see these two economic drivers as compatible. “The mine is literally directly in the headwaters of the two largest rivers that are feeding Bristol Bay,” Wallace explains. “And the real concern around it is that their tailings deposits are ridiculously close in proximity to those rivers. Mobilizing people around saving salmon is one of Wallace’s personal mandates — he sees such mainstays of subsistence and culture as important sources for solidarity. On the second-to-last day of Wallace’s time in Bristol Bay, he and his team were invited by the Yup’ik Nation to learn how to filet and process some freshly-caught salmon. When it comes to salmon, Bristol Bay is truly the world centre of sockeye runs. On average, the annual return of sockeye alone amounts to 37.5 million, according to the EPA. 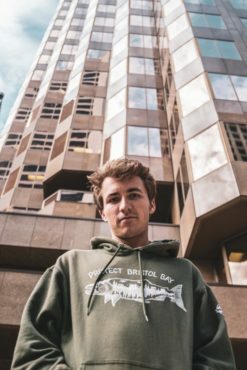 Wallace became involved in activism through music after his first two years of university, which left him feeling powerless in the face of the problems he was learning about — overfishing, ocean pollution, and climate change to name a few. While controversies over environmental problems often work to polarize different opinion bases, Wallace has always kept an eye out for those central pillars that connect us beyond differences, such as salmon. “We see every community, whether they’re settler communities — predominantly white communities — to Indigenous fisheries that have been around for ten thousand years, to urban chefs in Vancouver. It’s like everyone’s got these really amazing connections with salmon and they understand how foundational they are to coastal life,” Wallace says. During his trip, Wallace did not just observe how the various communities of Bristol Bay connect to salmon; he sought to inspire these communities to connect with one another as well. The team ended their trip by organizing a potluck dinner and concert in Dillingham, a community near Bristol Bay. The king salmon — or Chinook — must have heard word of the party, as they chose that day to make their first appearance of the year. “We got a dozen giant fish — like 30-pound, 40-pound king salmon and it was the first day they were running. They happened to show up and so we could eat fresh fish,” Wallace says. Wallace is excited to be visiting Victoria and says he sees it as yet another opportunity for people to come together to celebrate the beauty of this majestic coastline. While the impressive salmon runs and sustainable fishery brought Wallace to Bristol Bay, he says that an equally important goal of the trip is engaging British Columbians in protecting what’s here in the Salish Sea. The film documenting his journey will be shown at the Victoria Events Centre on Oct. 4 at 7 p.m. and will be followed by the revolution-revving riffs Wallace is known for.